Several shelves of our Northwood Russet. Russet appears to be a color that you either really like or hate! 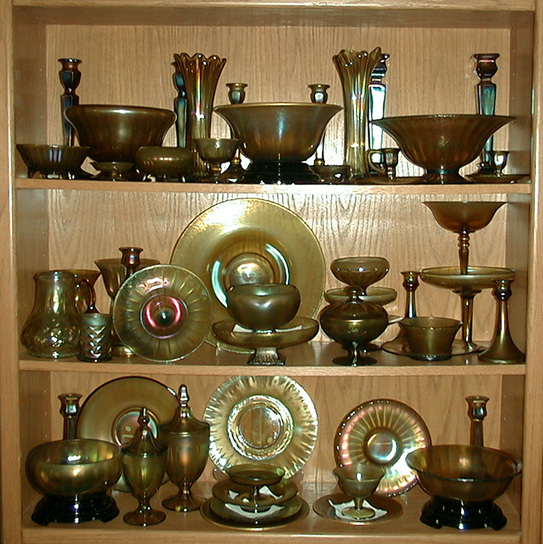 We like it, especially when it reflects great gold iridescent effects. We are still looking for a few pieces in Russet! Got a diamond optic pitcher? How about a rolled rim footed bowl with rays? 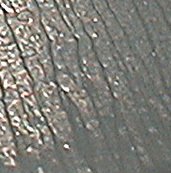 Appreciation of stretch glass in opaque colors is also another "really like it" or "yuck" situation. Over the years, we have gained a real appreciation for the subtle effects achieved by applying stretch iridescence to opaque and translucent glass. 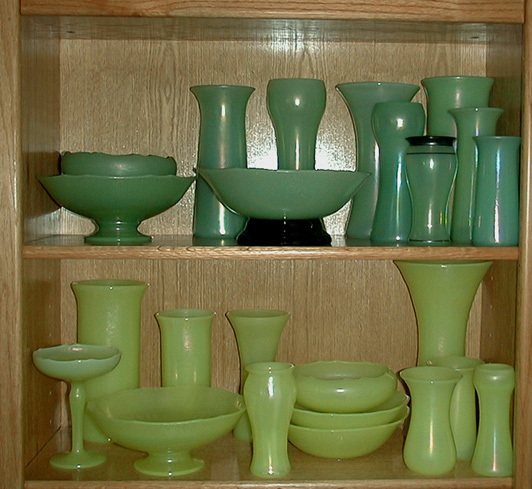 The opaque green and opaque yellow pieces from U.S. Glass are fairly obtainable but we're still trying to determine all the pieces made! Ruby stretch glass is always popular and we are no different. Unfortunately, since most carnival collectors also have an "appreciation" for red stretch, our pocketbooks prohibit us from acquiring all that we would like to have! 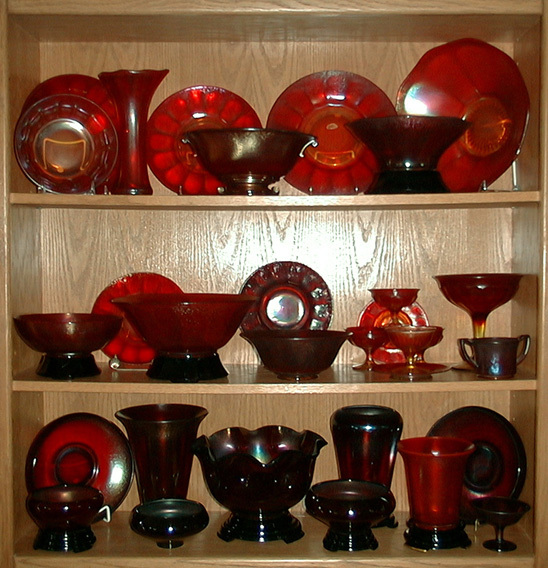 Most people really like ruby stretch glass, and many think that it is rare. In fact, ruby and amberina stretch is NOT rare. It is just highly desirable and prized by both carnival and stretch collectors. As far as we know, Fenton and Imperial are the two manufacturers that made nearly all the ruby stretch, but there is supposed to be a Diamond bowl in ruby known. We haven't seen it!